The venue for its first public appearance in the United Kingdom could hardly be more appropriate for the Bugatti Chiron. The motto of this year’s Goodwood Festival of Speed is “Full Throttle - The Endless Pursuit of Power”. The Bugatti super sports car with 1,500 PS and a top speed of 420 km/h limited for road use is being presented at the legendary hill climb – piloted by British racing driver and Le Mans winner Andy Wallace. The Goodwood Festival of Speed is being held from June 23 to 26, 2016. Bugatti is currently preparing for the start of series production of the 1,500 PS Chiron at the company’s headquarters in Molsheim, Alsace. The super sports car is to be produced in a limited series of 500 vehicles. More than 200 customers have already ordered their Chiron and the first vehicle is due to be delivered to a customer in the autumn of 2016. Since 1993, the Goodwood Festival of Speed has been one of the international highlights in the calendar for motorsports enthusiasts and fans of racing cars of all vintages. Every year in June, about 200,000 visitors flock to Goodwood House to the north of Chichester (West Sussex). The highlight of the event is the famous hill climb; the vehicles entering this event drive over a 1.16 mile (1.86 km) course with nine bends over the hill at Goodwood. The 23rd Festival of Speed is being held from June 23 to 26, 2016. The Bugatti stand is near to the Supercar Paddock. 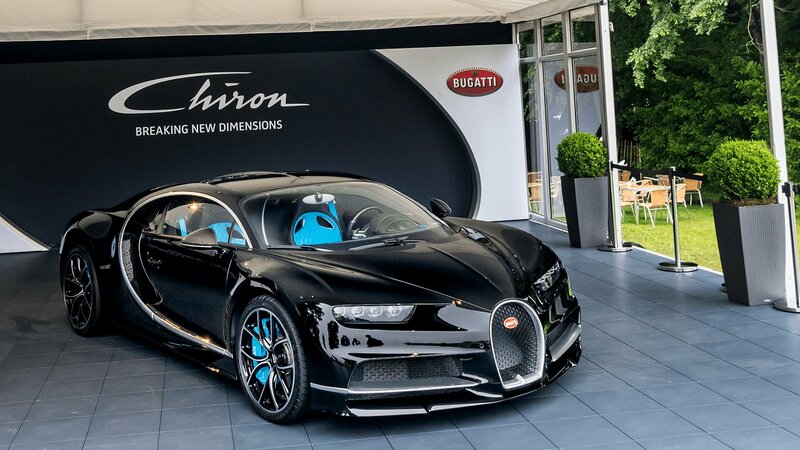 The Chiron celebrates its first public appearance in the United Kingdom at the Goodwood Festival of Speed 2016. This year’s motto “Full Throttle - The Endless Pursuit of Power” could hardly be more appropriate for the world’s most powerful, fastest, most exclusive and most luxurious production super sports car. The 1,500 PS supercar is being presented at the legendary hill climb this weekend - piloted by British racing driver and Le Mans winner Andy Wallace.